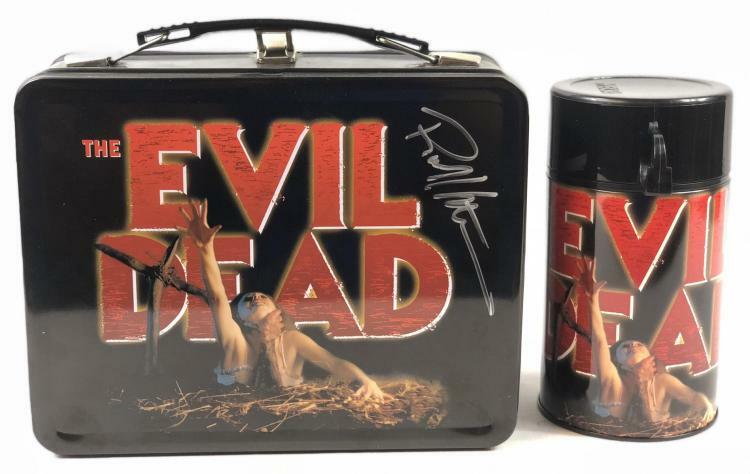 The Evil Dead Lunch Box & Thermos signed by Robert Kurtzman. The Evil Dead is a 1981 American supernatural horror film written and directed by Sam Raimi and executive produced by Raimi and Bruce Campbell, who also stars alongside Ellen Sandweiss and Betsy Baker. The film focuses on five college students vacationing in an isolated cabin in a remote wooded area. After they find an audiotape that releases a legion of demons and spirits, members of the group suffer from demonic possession, leading to increasingly gory mayhem. Raimi and the cast produced the short film Within the Woods as a "prototype" to build the interest of potential investors, which secured Raimi US$90,000 to produce The Evil Dead. The film was shot on location in a remote cabin located in Morristown, Tennessee, in a difficult filming process that proved extremely uncomfortable for the cast and crew.